This era was, on one hand, a religious conflict between settling Muslims and traditional Christians, between nationalities they represented, and on the other hand between feudal lords on power over the central government. Nobles came to abuse their positions by making emperors, and enroached upon the succession of the dynasty, by candidates among the nobility itself: e.g on the death of Emperor Tewoflos, the chief nobles of Ethiopia feared that the cycle of vengeance that had characterized the reigns of Tewoflos and Tekle Haymanot I would continue if a member of the Solomonic dynasty were picked for the throne, so they selected one of their own, Yostos to be negusa nagast (king of kings) - however his tenure was brief. Iyasu II asecended the throne as a child. His mother, Empress Mentewab played a major role in Iyasu's reign, as well as in that of her grandson Iyoas too. Mentewab had herself crowned as co-ruler, becoming the first woman to be crowned in this manner in Ethiopian history. Empress Mentewab was crowned co-ruler upon the succession of her son (a first for a woman in <?xml:namespace prefix = st1 ns = "urn:schemas-microsoft-com:office:smarttags" />Ethiopia) in 1730, and held unprecedented power over government during his reign. Her attempt to continue in this role following the death of her son 1755 led her into conflict with Wubit (Welete Bersabe), his widow, who believed that it was her turn to preside at the court of her own son Iyoas. The conflict between these two queens led to Mentewab summoning her Kwaran relatives and their forces to Gondar to support her. Wubit responded by summoning her own Oromo relatives and their considerable forces from Yejju. The treasure of the Empire being attestedly penniless on the death of Iyasu, it suffered further from ethnic conflict between nationalities that been part of the Empire for hundreds of years -- the Agaw, Amharans, Showans, and Tigreans -- and the Oromo newcomers. Mentewab's attempt to strengthen ties between the monarchy and the Oromo by arranging the marriage of her son to the daughter of an Oromo chieftain backfired in the long run. Iyasu II gave precedence to his mother and allowed her every prerogative as a crowned co-ruler, while his wife Wubit suffered in obscurity. Wubit waited for the accession of her own son to make a bid for the power wielded for so long by Mentewab and her relatives from Qwara. When Iyoas assumed the throne upon his father's sudden death, the aristocrats of Gondar were stunned to find that he more readily spoke in the Oromo language rather than in Amharic, and tended to favor his mother's Yejju relatives over the Qwarans of his grandmothers family. Iyoas further increased the favor given to the Oromo when adult. On the death of the Ras of Amhara, he attempted to promote his uncle Lubo governor of that province, but the outcry led his advisor Walda Nul to convince him to change his mind. It is believed that the power struggle between the Qwarans led by the Empress Mentewab, and the Yejju Oromos led by the Emperor's mother Wubit was about to erupt into an armed conflict. Ras Mikael Sehul was summoned to mediate between the two camps. He arrived and shrewdly maneuvered to sideline the two queens and their supporters making a bid for power for himself. Mikael settled soon as the leader of Amharic-Tigrean (Christian) camp of the struggle. The reign of Iyaos' reign becomes a narrative of the struggle between the powerful Ras Mikael Sehul and the Oromo relatives of Iyoas. As Iyoas increasingly favored Oromo leaders like Fasil, his relations with Mikael Sehul deteriorated. Eventually Mikael Sehul deposed the Emperor Iyoas (7 May 1769). One week later, Mikael Sehul had him killed; although the details of his death are contradictory, the result was clear: for the first time an Emperor had lost his throne in a means other than his own natural death, death in battle, or voluntary abdication. Mikael Sehul had compromised the power of the Emperor, and from this point forward it lay ever more openly in the hands of the great nobles and military commanders. This point of time has been regarded as one start of the Era of the Princes. An aged and infirm imperial uncle prince was enthroned as Emperor Yohannes II. Ras Mikael soon had him murdered, and underage Tekle Haymanot II was elevated to the throne. 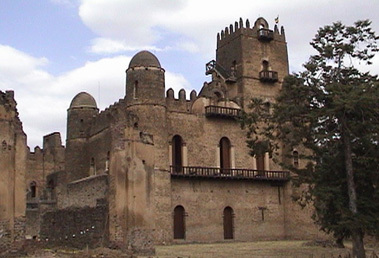 This bitter religious conflict contributed to hostility toward foreign Christians and Europeans, which persisted into the 20th century and was a factor in Ethiopia's isolation until the mid-19th century, when the first British mission, sent in 1805 to conclude an alliance with Ethiopia and obtain a port on the Red Sea in case France conquered Egypt. The success of this mission opened Ethiopia to many more travellers, missionaries and merchants of all countries, and the stream of Europeans continued until well into Tewodros's reign. This isolation was pierced by very few European travellers. One was the French physician C.J. Poncet, who went there in 1698, via Sennar and the Blue Nile. After him James Bruce entered the country in 1769, with the object of discovering the sources of the Nile, which he was convinced lay in Ethiopia. Accordingly, leaving Massawa in September 1769, he travelled via Axum to Gondar, where he was well received by Emperor Tekle Haymanot II. He accompanied the king on a warlike expedition round Lake Tana, moving South round the eastern shore, crossing the Blue Nile (Abay) close to its point of issue from the lake and returning via the western shore. Bruce subsequently returned to Egypt at the end of 1772 by way of the upper Atbara, through the kingdom of Sennar, the Nile, and the Korosko desert. During the 18th century the most prominent rulers were the emperor Dawit III of Gondar (died May 18, 1721), Amha Iyasus of Shewa), who consolidated his kingdom and founded Ankober, and Tekle Giyorgis of Amhara) - the last-mentioned is famous of having been elevated to the throne altogether six times and also deposed six times. The first years of the 19th century were disturbed by fierce campaigns between Ras Gugsa of Begemder, and Ras Wolde Selassie of Tigray, who fought over control of the figurehead Emperor Egwale Seyon. Wolde Selassie was eventually the victor, and practically ruled the whole country till his death in 1816 at the age of eighty. Dejazmach Sabagadis of Agame succeeded Wolde Selassie in 1817, through force of arms, to become warlord of Tigre.